Get your tickets at the designated Klook lane! With 360 Tai O Pass, travelers gain access to a round trip bus transfer, a boat excursion, a round trip cable car ride. 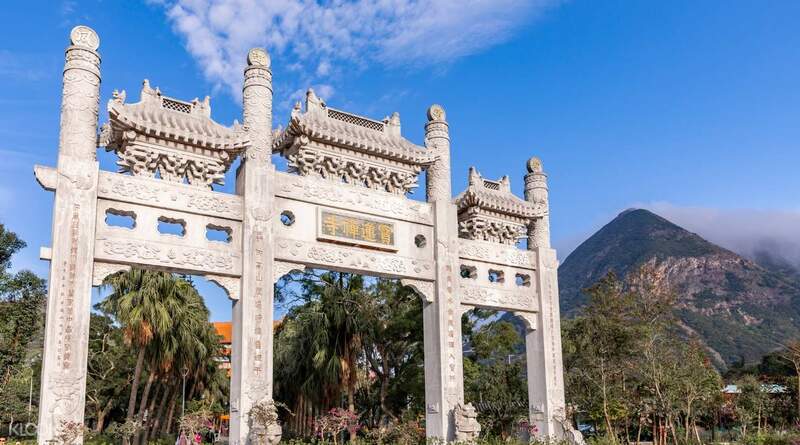 Ascend high above Lantau's verdant terrain and take a trek to the Big Buddha and enter the Po Lin Monastery. 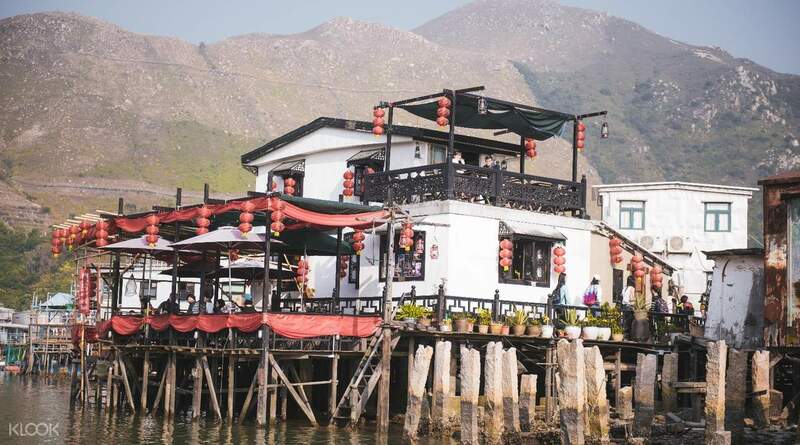 Take the opportunity to explore the further reaches of the island at Tai O's legendary fishing village where a boat is ready to take you to explore the stilt houses and perhaps sight a pink dolphin. You can also claim your tickets when you present your voucher at the designated Klook lane! Very very worth it! We had round trip passes for the cabin, unlimited bus rides, and the boat excursion. I suggest to walk up to the Buddha, Po Lin Monastery and the Wisdom Path. At the Tai O Village, try the Big Fishballs and the Cuttlefish! Try to allot your entire day for this tour to maximize your stay. Very very worth it! We had round trip passes for the cabin, unlimited bus rides, and the boat excursion. 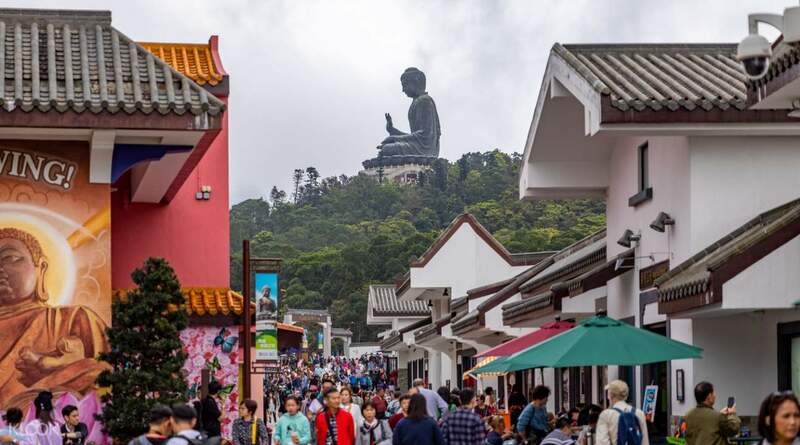 I suggest to walk up to the Buddha, Po Lin Monastery and the Wisdom Path. At the Tai O Village, try the Big Fishballs and the Cuttlefish! Try to allot your entire day for this tour to maximize your stay. Expect a long queue for cable car around 20minutes waiting time - ticket redemption was fine as Klook has its own counter. Cable car is shared - 10 passengers each. The ride though was good with a wonderful view to enjoy. We looked around Ngong Ping first - there were local shops with rude owners, so be careful. Careful not to step on cow poop - it’s almost everywhere. We enjoyed climbing up to Big Buddha - view from there was great and it was cold. Visited the temple as well but there was nothing much there. We then headed to Tai O via bus - timing schedule wasn’t really followed as they leave when it’s full (good for us). The same happened when we hopped on a bus from Tai O back to Ngong Ping, the bus took only a few people and left. When looking for the boat excursion look for a small kiosk inside the market area on your left side at the end of a walkway to the boat area (see the photo) - not all boats accept the voucher and they would not tell you where the voucher is accepted coz they want you to pay for them for the trip. The guy will even lead you to the wrong direction. So you have to go inside the market. We didn’t see the pink dolphins but it was a relaxing 20min boat trip. Boat crew could speak English. We had the doughnut and almond cookies. You are entitled for HK$40 worth for snacks and you just have to add more - eg. doughnut was for HK$13 so we gave HK$10 voucher and HK$3 in cash. Almond cookies were for HK$30. Expect a long queue for cable car around 20minutes waiting time - ticket redemption was fine as Klook has its own counter. Cable car is shared - 10 passengers each. The ride though was good with a wonderful view to enjoy. We looked around Ngong Ping first - there were local shops with rude owners, so be careful. Careful not to step on cow poop - it’s almost everywhere. We enjoyed climbing up to Big Buddha - view from there was great and it was cold. Visited the temple as well but there was nothing much there. We then headed to Tai O via bus - timing schedule wasn’t really followed as they leave when it’s full (good for us). The same happened when we hopped on a bus from Tai O back to Ngong Ping, the bus took only a few people and left. When looking for the boat excursion look for a small kiosk inside the market area on your left side at the end of a walkway to the boat area (see the photo) - not all boats accept the voucher and they would not tell you where the voucher is accepted coz they want you to pay for them for the trip. The guy will even lead you to the wrong direction. So you have to go inside the market. We didn’t see the pink dolphins but it was a relaxing 20min boat trip. Boat crew could speak English. We had the doughnut and almond cookies. You are entitled for HK$40 worth for snacks and you just have to add more - eg. doughnut was for HK$13 so we gave HK$10 voucher and HK$3 in cash. Almond cookies were for HK$30. 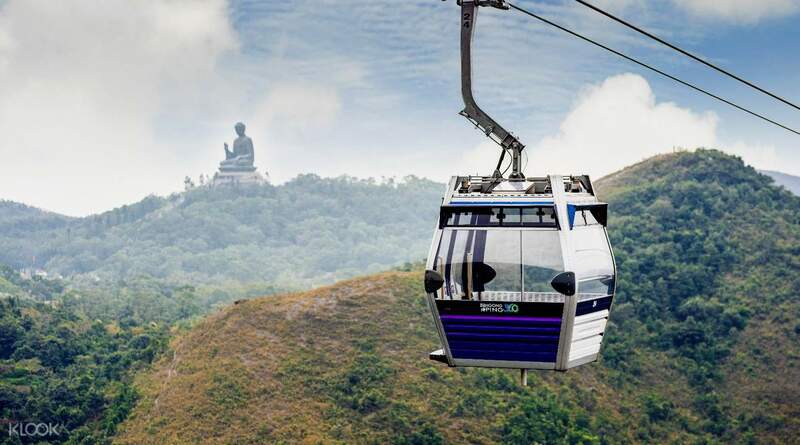 The Air, Land, Sea travel experience in Ngong Ping is superb... the klook line to get a ticket is shorter than that of the regular line... you can save a whole lot time... i recommend that you guys get the crystal cabin for a complete experience and superv view.. The Air, Land, Sea travel experience in Ngong Ping is superb... the klook line to get a ticket is shorter than that of the regular line... you can save a whole lot time... i recommend that you guys get the crystal cabin for a complete experience and superv view..
We reached around 9am plus & the queue was already so long if we hadn't bought the tics from klook. We took bus 21 to Tai O village first and spent a few hrs there taking pics, eating snacks & enjoying the cooling weather. Not so crowded as it is a weeekday which is a plus point but not all shops were opened. Do try the Tai O donuts and almond cookies there. The jumbo fishballs & squid balls are really good too! We reached around 9am plus & the queue was already so long if we hadn't bought the tics from klook. We took bus 21 to Tai O village first and spent a few hrs there taking pics, eating snacks & enjoying the cooling weather. Not so crowded as it is a weeekday which is a plus point but not all shops were opened. Do try the Tai O donuts and almond cookies there. The jumbo fishballs & squid balls are really good too! This package is really worth it. There's a special line for Klook customers so you can skip the long queue to buy a ticket and the package comes with roundtrip cable car tickets, unlimited day pass for the buses, ferry tickets, snack vouchers and discount coupons. Just be sure to check which shops have discount vouchers because they wont ask if you have one when you pay. This package is really worth it. There's a special line for Klook customers so you can skip the long queue to buy a ticket and the package comes with roundtrip cable car tickets, unlimited day pass for the buses, ferry tickets, snack vouchers and discount coupons. Just be sure to check which shops have discount vouchers because they wont ask if you have one when you pay. We had a great time and experience at Ngong Ping 360. When we arrived, we didn’t have to line up. Its like a VIP treatment. My parents was really amazed with the place and cable car. We were not able to get to Big Buddha since my parents can’t already walk that far. We had a great time and experience at Ngong Ping 360. When we arrived, we didn’t have to line up. Its like a VIP treatment. My parents was really amazed with the place and cable car. We were not able to get to Big Buddha since my parents can’t already walk that far. This was the first one I booked with Klook. So, I was a bit indifferent on what to expect. But when we got to Ngong Ping 360 cable terminal, it was so hassle free. Great day out at Ngong Ping & Tai O Fishing Village. Excellent experience with Klook. This was the first one I booked with Klook. So, I was a bit indifferent on what to expect. But when we got to Ngong Ping 360 cable terminal, it was so hassle free. Great day out at Ngong Ping & Tai O Fishing Village. Excellent experience with Klook. Very convenient, just show the bar code and exchange it to the the tickets at the cash desk. We were on Sunday at 10 a.m., waiting time to the crystal cabin was around 30 minutes. Highly recommended to buy packages as you will receive fast pass on the way back. Very convenient, just show the bar code and exchange it to the the tickets at the cash desk. We were on Sunday at 10 a.m., waiting time to the crystal cabin was around 30 minutes. Highly recommended to buy packages as you will receive fast pass on the way back. The cable car line to get to Ngong Ping was a bit quicker than the regular line, although it was still long. The ride took about 25 minutes each way with an amazing view throughout. The little village had plenty of food and shopping options. The Tian Tian Buddha was imposing and beautiful and the Po Lin Monastery was very regal. Unfortunately I didn’t spend much time at the Tai O fishing village (lost track of time) but it was a cool experience nonetheless. The boat ride excursion was about 20 minutes long. If you’re prone to sea sickness, I would not recommend going on the boat since you spend about 5 minutes just rocking in the waves. The queue for the cable car going back was brutal and took a little over an hour before even getting a cable car. Overall, it was a solid experience, one that I would recommend! The cable car line to get to Ngong Ping was a bit quicker than the regular line, although it was still long. The ride took about 25 minutes each way with an amazing view throughout. The little village had plenty of food and shopping options. 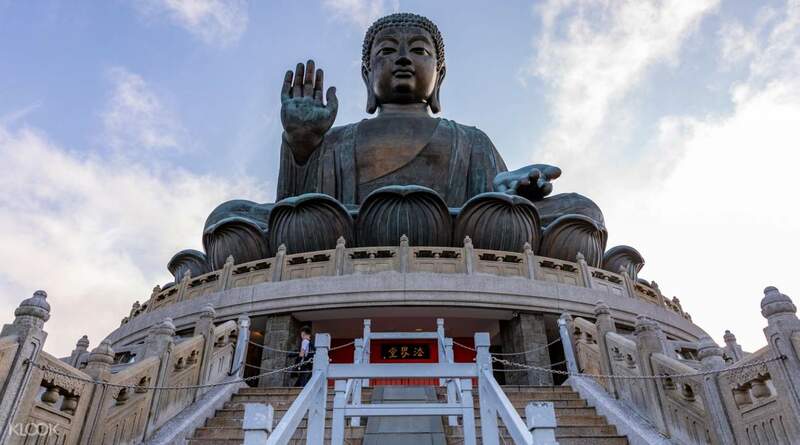 The Tian Tian Buddha was imposing and beautiful and the Po Lin Monastery was very regal. Unfortunately I didn’t spend much time at the Tai O fishing village (lost track of time) but it was a cool experience nonetheless. The boat ride excursion was about 20 minutes long. If you’re prone to sea sickness, I would not recommend going on the boat since you spend about 5 minutes just rocking in the waves. The queue for the cable car going back was brutal and took a little over an hour before even getting a cable car. Overall, it was a solid experience, one that I would recommend! Short line, easy to access for the cable cars. Highly recommend Taio if you like seeing local culture. You can take a boat around the small fishing village, see dried fishes and indulged in local snacks- tofu dessert and large squids. Short line, easy to access for the cable cars. Highly recommend Taio if you like seeing local culture. You can take a boat around the small fishing village, see dried fishes and indulged in local snacks- tofu dessert and large squids.